Will the DLNA Premium Video Platform Change the Set Top Box Landscape? The Digital Living Network Alliance (DLNA) was created by Sony in 2003 (originally called the Digital home Network Group) to enable sharing of digital media between consumer devices such as computers, printers, cameras, cell phones, and other multimedia devices. DLNA employs Universal Plug and Play (UPnP) for media management, discovery and control. UPnP defines the types of device ("server", "renderer", "controller") that DLNA supports network media methods. A layer of restrictions is then applied for the types of media file format, encodings and resolutions that a device must support. Today there are over 200 member companies, over 13,000 certified products and over half a billion DLNA-capable devices. According to DLNA’s chairman, Nidhish Parikh, this is projected to increase to 3 billion by 2016. Digital Media Server (DMS): Digital Media Servers (DMS) store content and make it available to network digital media players (DMP) and mobile digital media players (M-DMP), digital media renderers (DMR) and digital media printers (DMPr). Some examples of digital media servers include PCs and network attached storage (NAS). Digital Media Player (DMP): Digital Media Player products find content offered by a DMS or M-DMS and provide playback and rendering capabilities. DMPs are not visible to other devices on the network such as Digital Media Controllers (DMC or M-DMC). Examples of DMP devices include TVs, home theater systems, game consoles and handheld mobile devices like smartphones. Digital Media Controller (DMC): Digital Media Controller products find content offered by a DMS or M-DMS and match it to the rendering capabilities of a DMR – setting up the connections between the DMS and DMR. An intelligent remote control is on example of a DMC device, such as a tablet or smartphone. 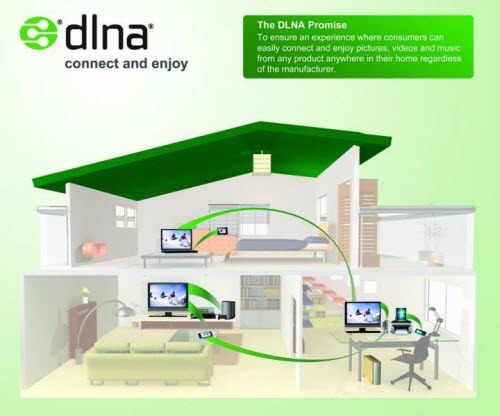 Introduced at CES 2012, the DLNA Premium Video Platform allows streaming, but not recording, of premium content to DLNA-certified devices in the home. The DRM agnostic technology allows service providers to enable whole-home networking to DLNA-certified products, including digital TVs, tablets, mobile phones, Blu-ray players and video game consoles. Instead of requiring a set-top box in every a room, a user can start watching in one room and continue playback on any DLNA-certified device anywhere within the home. Devices that can record, such as NAS drives, computers, etc., will probably not be Premium Video certified. The critical component of DLNA Premium video is DTCP IP. Created by Hitachi, Intel, Panasonic, Sony and Toshiba, DTCP is a method of protecting audio and audiovisual entertainment content over high-speed, high-bandwidth bidirectional digital interfaces on consumer electronics entertainment products. With DTCP, content can travel between these devices or across a digital home network. Content that arrives at the home in protected form and remains protected against unauthorized retransmission and copying. No technology standard is complete without a competitor and DLNA Premiun Video has one: HANA. The High-Definition Audio-Video Network Alliance was founded in 2005 by JVC, Mitsubishi and Samsung from consumer electronics; NBC Universal and Charter Communications representing multichannel video content and distribution; and Sun from information technology. HANA has a single focus (which may be it's downfall): HD Video and is based on long-distance FireWire. In contrast DLNA supports all media types and has a massive installed base of compatible devices. Supposedly the two can coexist (but without a unified interface) and HANA say that the two are synergisitc. I'd put my bet on DLNA. Surprisingly, cable companies and CableLabs are on-board with the technology. Today, the only way to distribute premium content is to have a DVR or set-top box in every room, which typically costs anywhere from $15-30/month per device. With Premium Video, and device (such as Roku-type devices, SmartTv’s and Blu-ray players can stream live or recorded content. This will no doubt affect the cable companies’ bottom line (but I’m sure they’ll find a way to recoup that revenue). If you’re planning to stream 1080P a lot, today’s Wi-fi isn’t going to cut it. That said, 802.11ac products, with a 1.3Gbps peak transmission rate are just beginning to appear on the market. Clearly, if you’re streaming to a tablet or smartphone, you’ll have to use wireless, but hopefully transcoding to a suitable resolution will reduce the network demands. This is the obvious choice for those wishing to use traditional networking technologies. When I required my house, I ran Cat 6 to most places, and left conduit from basement to attic for additional future needs. For those with cable in every room, MoCA (Multimedia over Coax Alliance) is an obvious choice and tends to be officially supported by cable companies. For those where none of the above is practical, powerline networking may be a viable option. HomePlug, which accounts for about 85 percent of the worldwide installed base of powerline network devices, is now DLNA certified. This is a tough question. Comcast and Intel showed a proof of concept in January. 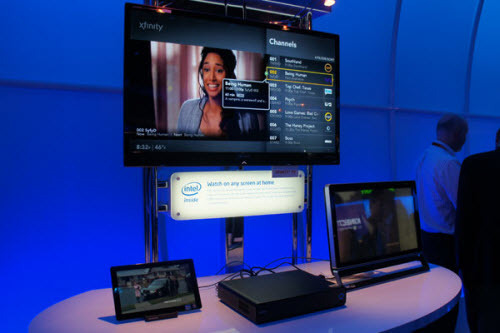 The demo featured the Pace box that Comcast is currently using for its Xcalibur trial in Augusta, Ga. Comcast had teamed up with Intel, which provided the new Pace set-top boxes. The proof of concept demo added in an IP port on the Pace box to securely deliver Premium Video to DLNA devices. Comcast CTO, David de Andrade, said the roadmap of the future would include transcoding of the various streams in the box, as well as adaptive bit rates. De Andrade said the technology demo configuration used Ethernet out, but in a deployed configuration, the IP connection will be MoCA out. For now, it’s wait and see. Hopefully, this will be a technology that comes to fruition and doesn’t get swept under the carpet.